These are four products used in rotation in the last months. I have combination to oily skin, my forehead and chin get extremely oily and my pores are huge, and I mean huge. Deep cleansing products have always been on my list, I want my skin to feel super clean and my pores unclogged. 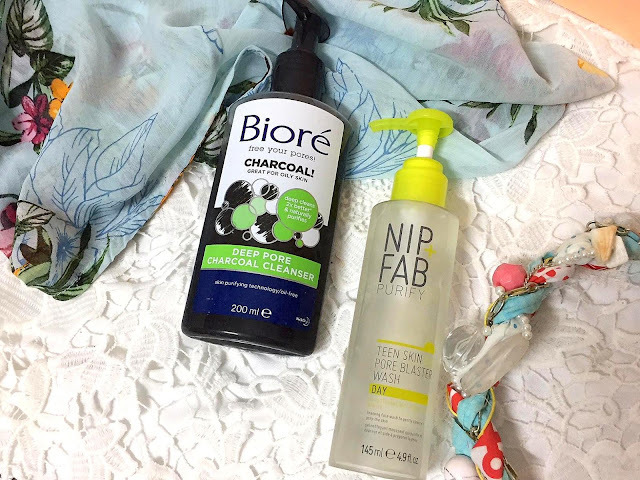 Biore Charcoal Deep Pore Cleanser - I have been using this daily cleanser for over a month now and it is gentle but effective for my combination/oily skin. It deep cleanses and draws impurities, dirt and makeup. It is a thick black gel that applies nicely, it doesn't produce much foam but it leaves my skin super clean and fresh. I normally use this cleanser when having a shower after a stressful and long day to deep cleanse my pores and I am left with a clean and refreshed skin. I read a couple of reviews that this product burns the skin and also causes breakouts, I had no problems or any of these issues. 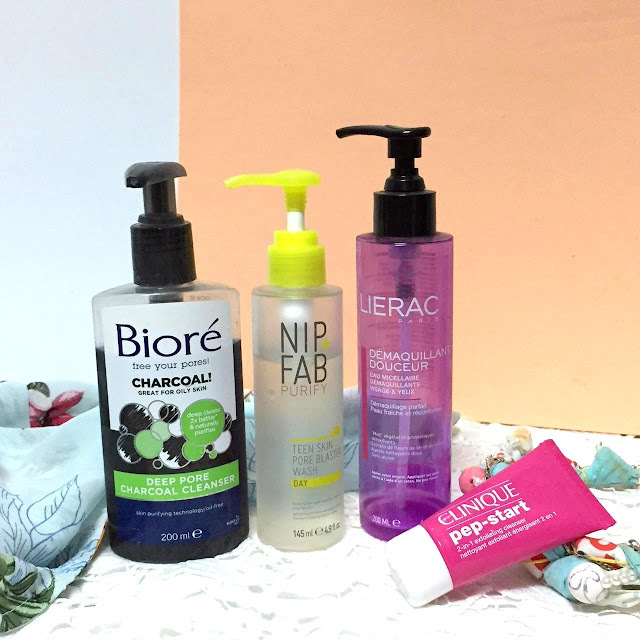 Nip+Fab Teen Skin Pore Blaster Wash - another great cleanser I have been using lately that it's great for the type of my skin. I don't have acne or pimples (aka teen skin) but this works brilliantly in reducing oiliness and giving me a shine-free and matte skin. Clinique Pep-Start Exfoliating Cleanser - this is a 2 in 1 product from Clinique, it is a gel that cleanses and exfoliates at the same time. This gel takes away dirt, dulling dead skin cells, excess oil, and impurities to give skin a smooth finish and a radiant glow. It is gentle enough to use twice a day. The effects and results it gives to my skin reminds me so much of the Lancer Polish I tried a few months ago and it was one of the best exfoliators I tried, giving me fresh and clean skin and probably the smoothest complexion ever. 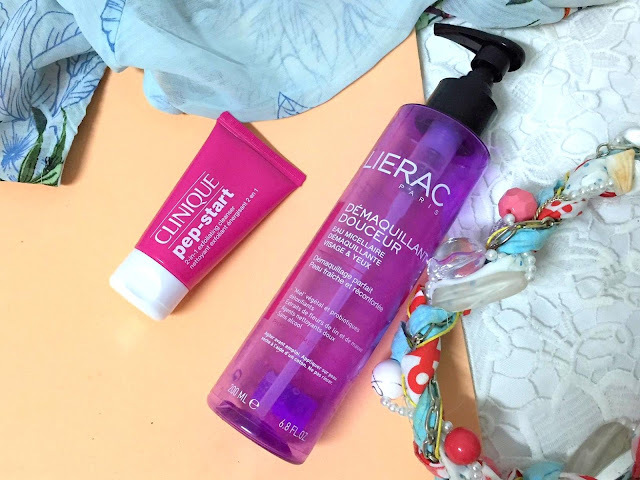 Lierac Micellar Cleansing Water - I bought this product last summer but it is one of those products that I used for a week, then stop using it because I had other new products to try and test for review purposes and then started using it again. 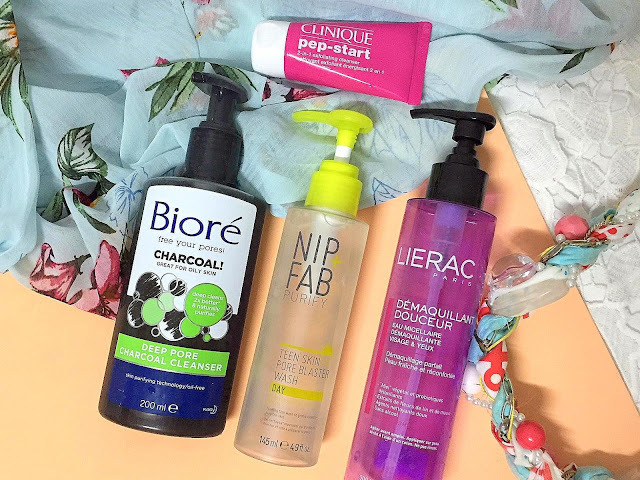 It is an excellent micellar water and extremely effective, you can see from the bottle in the photo that it is almost empty, there is only one more use in this packaging. It features a lightweight botanical formula that easily removes dirt, excess oil and makeup from your skin without drying or causing irritation. Will re-purchase when I run out of the micellar waters I am currently using. Have you tried any of these products? What cleansers are you using at the moment? Any recommendations for combination/oily skin?